Yes this is part of #LeniLeaks! 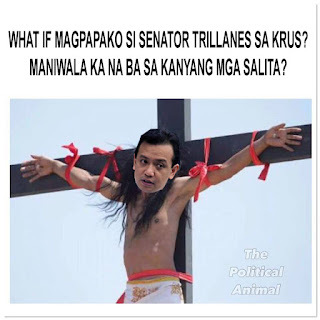 After several investigations of #LeniLeaks and #LoidaLeaks something else came out. Loida Nicolas-Lewis was revealed that she has already a new facial cream at the works. 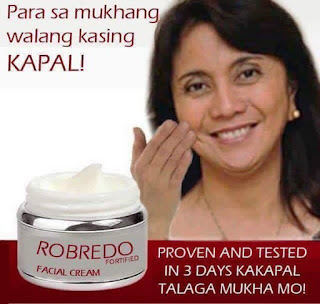 Investigation has revealed this new product called "Robredo Facial Cream". The draft ad revealed a picture of Vice President Leni M. Robredo as the model for the new facial cream. One of the failed to cover leaks reveal Mrs. Lewis' master plan to distribute "Robredo Facial Cream" to Filipinos for use. The cream is said that it will make your face thick. Leakage also showed that Vice President Robredo herself was its test subject. After several tries her face had already become thicker in three days prior the May 2016 elections. It was later confirmed that Senator Leila Dilemma had been using samples of the Robredo Facial Cream as another test subject. DOJ Secretary Vitaliano N. Aguirre Jr. said, "No wonder Leila's face is thicker than usual. She was using this new facial cream to give her no shame." Later leaks prove that Senator Dilemma was also a test subject of Lewis' facial cream that makes faces thicker in three days.